It enticed me with its simplicity, configurability and option between charging speed or desulfatability. The problem is that in real practice lamp eats 20-50% of wattage, what i want to avoid. How could i modify scheme to get rid of lamp and raise its efficiency to 85-95%? PS. It needs to be done by limiting current but not dissipating extra power in air as with lamp. Conclusion: Ultimately, this is NOT the best way to make a pulse charger. (Design too simple, compromises too complex. ) 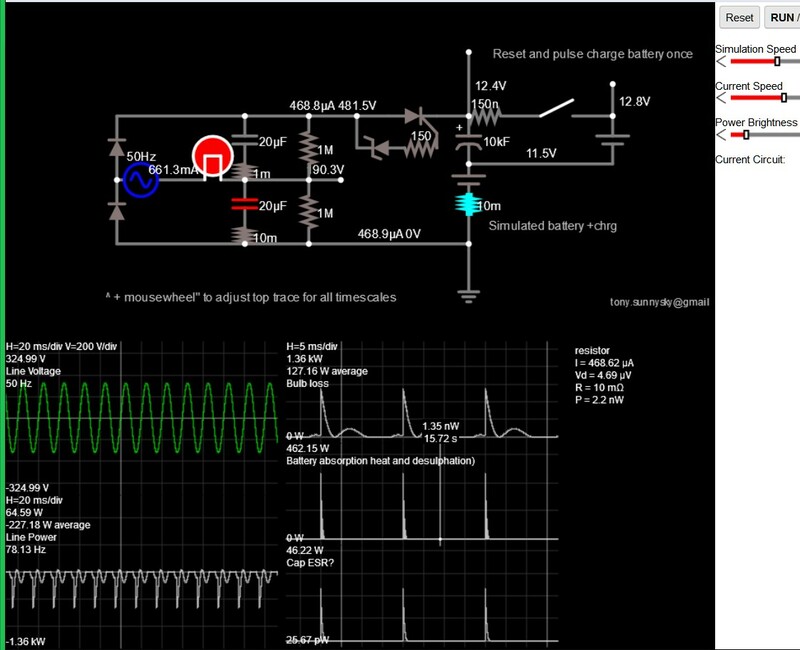 1st make specs for input and output pulse current, rise time, duration. The best simple way uses the battery itself to make negative spikes then a simple battery charger to make up the 5W to 500W you choose for desulphation rate. You have something that works with a similar efficiency of any unregulated bridge diode-RC charger with a lot of low rep rate (100Hz) line pulse noise too. It ought to pulse at 20k to 50kHz rate with microsecond pulses and current depends on design but with 100W rapid and 5W maintain desulphation without acid electrolyte evaporation at > 14.2V. Basically, as we heard from an investor who wanted to buy my client's patent for $1m, they had a blow torch but once trigger auto accelerometer sensor airbags nearby, we had a Bic Lighter that worked using only 5W to trigger sulphate crystal breakdown from harmonics. I see better that you know what you are doing. Newbies, do not try this yourself without details on each component. Risks of doing it wrong are severe. The bulb characteristics are 1:10 R ratio e.g. 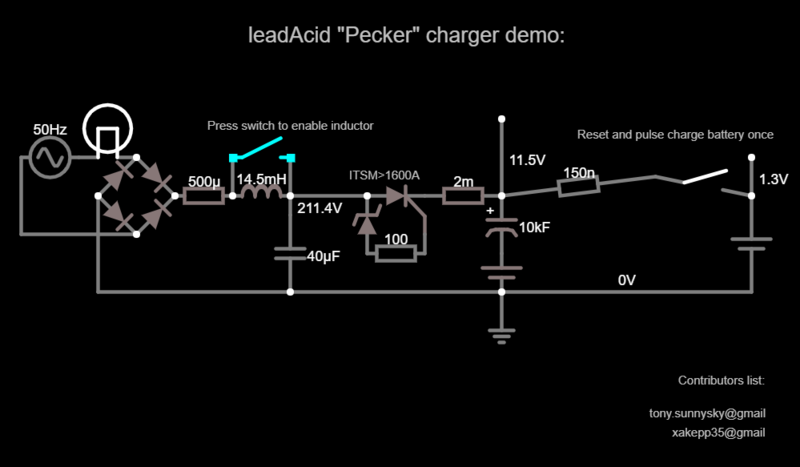 10 to 100 Ohms (cold to hot) at rated power but heat rise time and cool delay time affects the pulse characteristics of this bulb pulse SCR charger. In some ways, the bulb heat modulation with the diodes mimics a "PTC semiconductor", current limiter, but not efficiently. Conclusion> The only way to improve efficiency is to reduce ESR of expensive caps and insert bulky ferrite core very low DCR coil (LC filter) to reduce current and store energy. That is how Buck regulators store energy. Reducing bulb resistance is the only way to reduce losses but that affects pulse width and current so they run cool. This is my sim. You must change the values to your model. I support the theory and practice of pulse de-sulphation for. My former employer used to manufacture them and I verified the design and I know someone with 20kHZ 300A ? ?ns pulse battery rejuvenator that works extremely well. This work ONLY for proven experienced technical people that understand battery and Cap ESR and that a short-circuited battery cell fuming hydrogen can be dangerous. I cannot optimize your design, off the cuff, without these characteristics. But with this tool and your actual model, you might. You can even change the battery 10mOhm ESR with an ideal pot of 100mOhm value and adjust it. I've done a similar thing in my past life ;) in Winterpeg, Manitsoldhere, Canada with cold dead batteries and not having a charger at the time in the late 70's and even later. To reduce 120V/60Hz to12V means I was 10% efficient so I used a 1500W toaster in series with "HOT" = Line1 120V. It got me to work on time in frigid weather. After a toaster, I used a single 25A diode in a glass of snow after the ~100V voltage drop with a careful connection of my neutral (near 0V earth) to chassis ground. At least I could heat a bagel while waiting 10 minutes to get enough charge to start the engine. You can't, this circuit needs the lamp to limit the current. Without the lamp too much current will flow and battery and/or diodes and/or SCR will blow up. This circuit is very crude and also unsafe and inefficient like you mentioned. That's because it doesn't do anything to convert the high mains voltage efficiently to a lower voltage (while raising the current) to charge the battery efficiently. To safely charge the battery mains isolation is required. To efficiently charge the battery a transformer is needed. Although this circuit is "very good and working solution" (your words, not mine) it is a nasty and cheap solution. I have seen proper (but cheap) car battery chargers which aren't expensive but are safe and (somewhat) efficient. In any case they will be more efficient that this solution. So in conclusion: no there's nothing that can be done to improve the efficiency of this circuit, it is a crappy circuit which cannot be improved. OP complained that this doesn't answer his question. I think it does because when I wrote this answer the question was How could i modify scheme to get rid of lamp and raise its efficiency to 85-95%? I explained that it is not possible. Also the question was changed, the posted circuit was incorrect, however the "new" circuit worked more ore less in the same way. Also it was not made clear (in the first version of this question) that this circuit was for desulfation of the battery. The fact that a circuit "works" doesn't make it a "good" design. I already mentioned the safety issue. Imagine using this circuit to revive a dead car battery. A car battery has a direct connection to the car's chassis so that chassis might become mains live. Also the discharge cycle is quite "violent" and will be hard on the capacitors limiting their lifetime. How to limit current precisely? How to measure current without shorting/how to limit current? How to calculate this current limit circuit?